For the first time ever, global advertising spending is forecast to surpass $500 billion in 2011. Yes, it’s true that the usual suspects – North America, Europe and China – are still responsible for the bulk of spending. But a closer look at growth rates forecasts a more provocative story. The takeaway here is simple: there’s a lot of money floating around in the global advertising market, and the bulk of growth is coming from lower-income regions. There’s also a lot of talk – especially in this publication – about a flurry of funding trends like impact investing. But how much of the average social venture’s income portfolio is comprised of revenue from corporate advertisers? In other words, when Airtel buys ad space on a billboard in Mumbai, or when Coca Cola pays to paint a roadside kiosk in Kikuyu, they’re paying someone. Why doesn’t that someone include you? That’s the question social entrepreneur Magali Bongrand asked upon founding INSTINCT – a social enterprise that leverages corporate ad money to finance its social ventures. She started with a crippling problem facing young children in one particular Ghanaian community: the walk to school spanned 16 km. Never mind the opportunity cost of lost time; expected truancy rates were resulting in an incalculable missed education opportunity. So INSTINCT designed Trickademik, a bicycle-like vehicle that transports up to six children at a time (see picture above). But building and sustaining a fleet of vehicles to transport kids to schools is no cheap endeavor. So Bongrand, with a background in media investment, offered a proposition to advertisers like Zain, the global telecommunications company: we’ll give you ad space on our vehicles to reach base of the pyramid consumers if you fund our fleet. In the first three years, INSTINCT estimates a fleet of 800 bicycles serving 3,200 children daily, creating 800 jobs for drivers and maintenance agreements with 30 local entrepreneurs. But why stop at transport? Why not tap the ad market to finance, say, public lighting? INSTINCT transplanted the same model to solar lighting in poorly lit Ghanaian communities – selling ad space on their innovation to corporations which in turn finances the infrastructure. 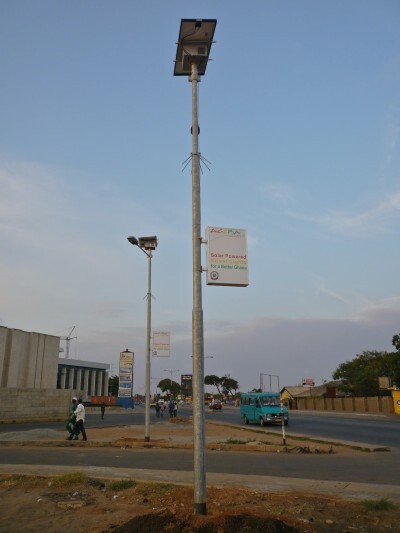 The enterprise expects to erect 2,500 solar powered streetlights in three years (see below). The model is bold. 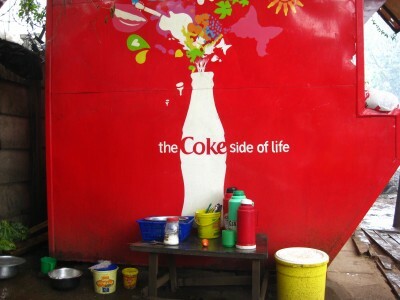 On one side, it posits that social enterprise can play in the global ad market – a nascent but promising idea, especially when funding is the always-acute challenge for the social sector. And on the other side, it offers a new frontier for corporations who struggle to reach the BoP with their communications, and who have yet innovated few effective models to do so. The two sides certainly represent very different objectives – one wants to get more kids to school, and the other wants to advertise more products. But innovations are often born at the intersection of disparate needs. In this instance, when the needs of communities (infrastructure) and the needs of corporations (advertising to the BoP) aligned, it offered Bongrand a new opportunity to create enormous mutual value. INSTINCT has boldly identified and leveraged that alignment. Who’s next?